1. Added an option, "Save webcam video as separate file (.mp4)". 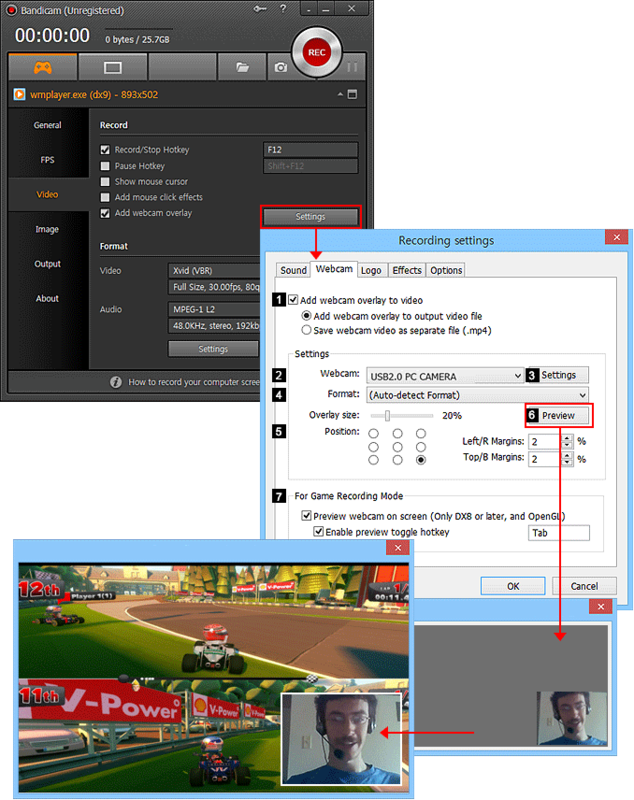 - Bandicam is now able to save a webcam video and game/screen video separately into two video files. 2. Added a volume slider to adjust the microphone volume. 3. Improved the recording performance of H.264 (CPU) encoder. 4. Improved the hooking compatibility with DirectDraw games/programs (ddraw.dll). 5. Improved the compatibility of webcam overlay with DirectX 9 games/programs. 6. Improved the stability of uploading to Vimeo. 7. Added support for H.264 (AMD APP) of R7 360/370 and FirePro series. - The preview window of the 'Device Recording Mode' was maximized/minimized when the image capture icon was double-clicked. - The recording progress timer was displayed incorrectly . - The mouse cursor on PowerPoint wasn't recorded when using a certain video resolution. - The webcam preview function didn't work properly on the 'Need for Speed: Most Wanted' game.